We love hearing from our fellow sock monkey fans. We enjoy sharing the fun sock monkey patterns and craft ideas. Very soon you will be able to submit your own sock toy creations to share with others. We'll keep you posted and let you just as soon as it's available. We hope you have had fun popping in and look forward to your submissions soon. 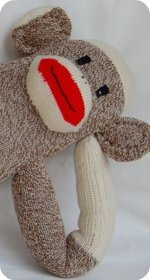 Thanks for visiting Funky Sock Monkeys.com. If you have any questions, want to provide feedback, or just want to say "hello" contact us via the form below. Thanks for taking the time to contact us, we welcome your feedback. Any information you provide is kept absolutely private.